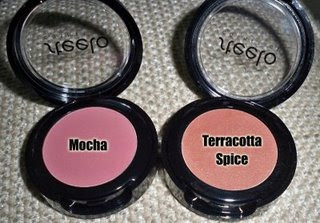 One of my new favorite brands is Steelo Cosmetics. I've been using them over the last few weeks and I really love their products. 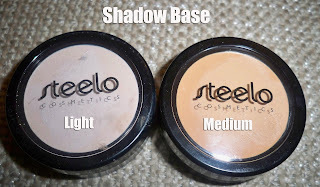 In a previous post I said if MAC and Bobbi Brown had a baby, it would be Steelo Cosmetics. Most of the reasons why I like them is because honestly it's just a quality product. A lot of times when I try new brands, I'm a little disappointed with the mediocre quality...this happens a lot with new/start up makeup companies. A team of makeup artists developed Steelo to cater to all women of color (light to dark) and it is reflected through their choice of color selection. If you look at the Steelo Website, you'll see various ethnic women celebrating color in all forms. I think I might have even spotted a Pinay! My favorite products from this line are the single eyeshadows, lipglosses, lipliners, eyebrow pencils, and body shimmers (use them on the face - gorgeous!). The eyeshadows are definitely up to par with MAC, and their color range varies from beautiful earthy tones to bright and vibrant colors. 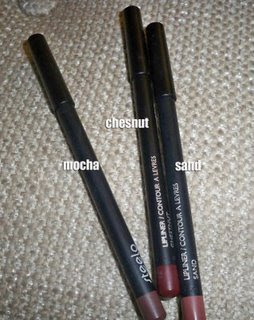 All of the lipliners, glosses and lipsticks complement all women of color. Single Eyeshadows - my fav! 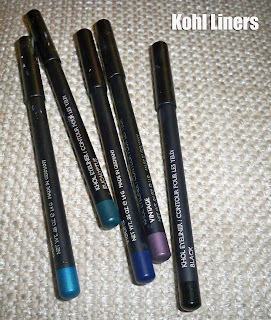 Eyebrow pencils - Earth Brown is my shade, taupe would be for lighter hair colors. The pencil has just the right amount of waxiness so that it creates little feather strokes. These lipglosses are amazing. Super smooth, not sticky, and the colors are gorgeous. 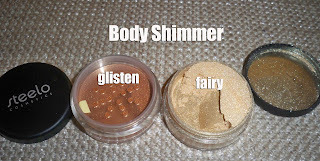 This product is called body shimmers but I use them on my face. The glitter particles are so fine and the powder is smooth that it just glides over your face giving a glow, not at all glittery and chunky looking. The color on the left, Glisten, is a gorgeous bronze shade...beautiful on darker tones. 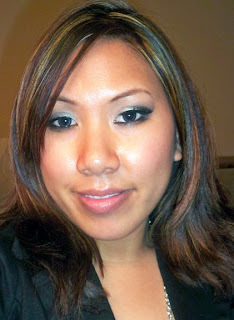 The color on the left, Fairy, is my go to color...I rocked this in the Philippines! I've done a few looks over the last couple of weeks using Steelo...check them out! 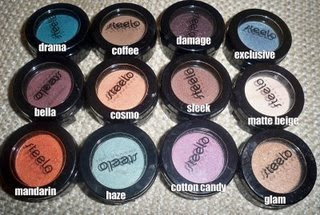 First off, all of these eyeshadows are worn using Steelo's Eyeshadow Base in Light and Medium. Medium is my perfect shade. The consistency is like a sticky cream shadow...which definitely helps to make eyeshadow stick. Make sure to blend out the edges. It also helps to put a base shadow on top to help blending. 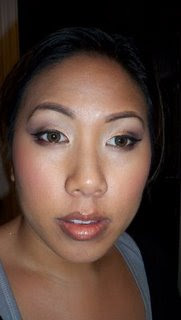 The first two looks were done using the Eyeshadow Trios. Here I am modeling the eyeshadow trio in Onyx, Matte Beige eyeshadow as a highlight, as well as a little bit of MAC's Soft Brown above the crease. Mocha blush on the cheeks, and on my lips I'm rocking a Max Factor lipstick with Steelo's Chesnut lipliner and Sultry lipgloss. In this look I went for bronzey...wearing the eyeshadow trio in Entourage, as well Matte Beige e/s as a highlight and Mandarin e/s on the lid. 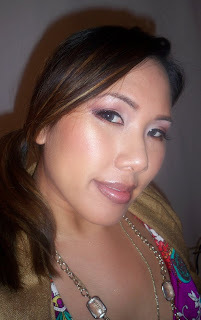 On my cheeks I'm wearing Terra Cotta blush and Fairy Body Shimmer. 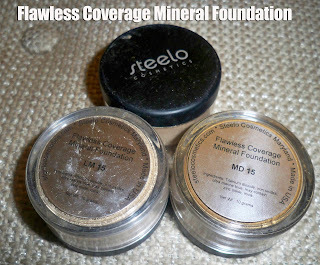 I'm also wearing Steelo's mineral foundation...not sure of the shade though. When I do another tutorial I'll pick another shade. On my lips I'm rocking Mocha lipliner and Runway lipgloss. This is a fall asleep and then wake up and take a picture of my makeup shot, lol. Let's just focus on the right eye since most of the makeup faded off. 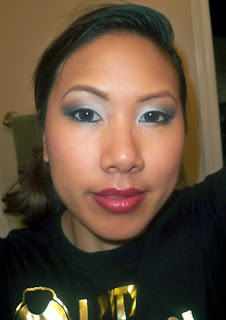 Here I am wearing Haze and Exclusive Eyeshadows (gorgeous blues) as well the black from the Onyx Trio. Another bronzey look. Here I am wearing Steelo's foundation and Mocha blush. On my eyes I have the following eyeshadows: Matte Beige, Bella, and Drama. On my lips I have Sand Lipliner and Pink Pearl lipgloss. 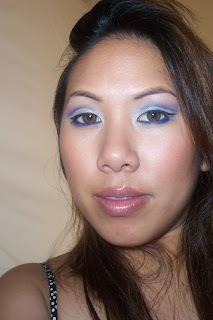 In this look I cut the crease with Violine Kohl pencil. On the lid I have Haze eyeshadow. I'm wearing Sand Lipliner and Crush lipgloss. Here are some shots of the mineral foundation...my skin tone has changed so much over the last few weeks with getting a tan that I need to go back and determine my exact shade. 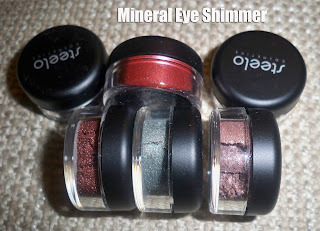 If you're into loose mineral eyeshadow, they also have a large assortment of gorgeous eye shimmers. Apparently it's also one of their most popular products. I'm planning on doing a tutorial on one of my looks...please leave me a comment and let me know which one you like! Hey Ren Ren! I love all your looks that you did with Steelo. I can't wait for the tutorials! Keep up the Awesome Job! Take Care...Bye! I'm loving the first bronzey look and the blue one! Your skin looks amazing btw! i just watched your haul video on the naked honey and i am so getting the highlight powder! You look so pretty in all of the looks :D Those products look lovely too. love it! beautiful looks! the steelo's look awesome! of to check their site out. Hey girl. Love the bronze look on you, can you do a tutorial on cutting the crease. I love the sultry gloss on you! I agree with Nina, your skin looks great. I had never heard of Steelo but I think I'm gonna have to check them out. Am super excited they pertain to women like me also!! I absolutely your first bronzey look (2nd pic)! You look beautiful Ren! You having really nice skin.